On 21 May 2009, after weeks of gruelling climbing, Mick Parker reached the summit of Makalu in the Himalaya, 8463 metres above sea level. He was now a veteran of the `8000ers club' - those elite adventurers who have scaled the world’s highest mountains. What’s more, as with all his climbs, he’d done it without the help of bottled oxygen, guides or Sherpas: a method that was extremely dangerous, but revered by purists. The stunning achievement crowned a ten-year climbing career that had begun in suburban Victoria, before taking on New Zealand, the US, South America, and finally the ultimate challenge - the Himalaya. His face slathered in sunscreen, Mick smiled, squinted, took a photo of the magnificent vista, then prepared for the long descent. Thirteen days later, he was found dead in his Kathmandu hotel room. He was only 36. 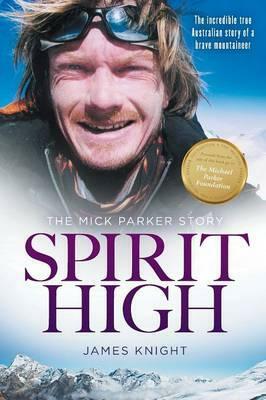 A story of courage, determination and high-altitude adventure, Spirit High details the exhilarating but all-too brief life of Mick Parker. An Aussie larrikin who knew no fear, but cared deeply for his fellow human, it is a tale of triumph, tragedy and chasing your dreams - no matter where they take you. All proceeds from the sale of this title will go to the Michael Parker Foundation to assist with the education and ease the hardship of disadvantaged children in Nepal, Northern Pakistan and Australia.